The OOI Program will continue to accept comments regarding the installation, operation, and data products of the Pioneer and Endurance Arrays through the Question & Comments link on the OOI homepage. The descriptions of the final Pioneer Array design, Endurance Array design, and summaries from past meetings are listed below. During the course of several public meetings, members of the mid-Atlantic commercial fishing community suggested the dialog regarding micro-siting and navigational safety concerns continue through smaller, informal meetings to better address issues and concerns associated with the installation and operation of the Pioneer Array. The Consortium for Ocean Leadership (OL) provided funding to the Commercial Fisheries Research Foundation (CFRF) to facilitate a series of four workshops between representatives from the regional fishing community and regional scientists during the fall of 2011. These meetings were summarized in a report titled Pioneer Array Workshops – Exploration of Issues and Concerns Connected with the Planned OOI Pioneer Array Project Summary Report (CFRF 2012). Recommendations from this report informed the final configuration of the Pioneer Array. The description of the Final Pioneer Array Design and related micro-siting documentation are posted below. Additional site-specific activities and coordination with Pacific Northwest marine users were conducted after the completion of the Final SSEA as part of an on-going micro-siting process to ensure the selection of the best mooring site locations that meet the science goals of OOI as well as avoiding and minimizing conflicts with other marine users in the region. 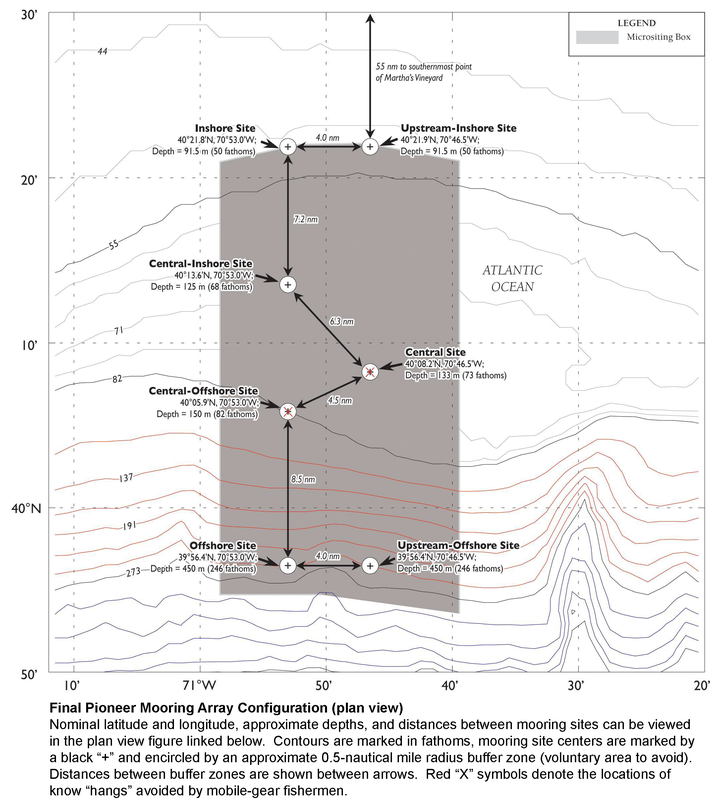 The final mooring site locations of the Endurance Array – Oregon Line are the result of discussions with the commercial fishing communities, additional site-specific bathymetric surveys, and at the offshore site, acceptable route for cable burial. Following suggestions of the local fishermen and other marine users and with agreement of the Quinault Indian Nation, the Endurance Array – Washington Line Inshore site was moved approximately 9 nautical miles north of the site assessed in the Final SSEA. Small adjustments to the final locations of the Washington Line Shelf and Offshore mooring sites have been made based on discussions with the fishing communities and additional site-specific bathymetric surveys. The National Science Foundation (NSF) Division of Ocean Sciences in the Directorate for Geosciences has issued the Final Site-Specific Environmental Assessment (SSEA; NSF 2011) for the OOI. The Final SSEA was prepared to assess the potential impacts on the human and natural environment associated with proposed site-specific requirements in the installation and operation and maintenance of the OOI that were previously assessed in a 2008 Programmatic Environmental Assessment (PEA) and a 2009 Supplemental Environmental Report (SER). The scope of the environmental impact analysis of the SSEA is tiered from the previously prepared 2008 PEA, associated Finding of No Significant Impact (FONSI), and 2009 SER. It focuses only on those activities and the associated potential impacts, including cumulative impacts, resulting from the site-specific installation and operation of OOI assets that were not previously assessed in the 2008 PEA and 2009 SER. The NSF has issued the Final Supplemental Environmental Report for Modifications in the Design, Infrastructure, and Installation of the Coastal-Scale Nodes, Regional-Scale Nodes, and Global-Scale Nodes of the Ocean Observatories Initiative (OOI) (February 19, 2013). This 2013 SER, a tiered document under the SSEA, contains the assessment of the potential impacts on the human and natural environment associated with proposed modifications in the design, installation, and operation of components of the OOI not previously assessed in the SSEA.